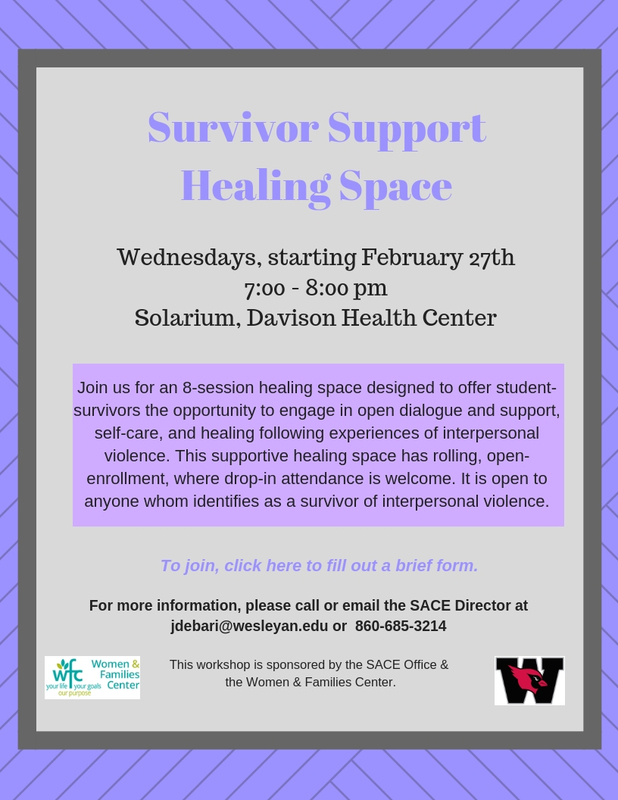 Starting on Wednesday, February 27th at 7 pm, myself and a Women & Families Center Advocate will be opening an 8-session healing space designed to offer student-survivors the opportunity to engage in open dialogue and support, self-care, and healing following experiences of interpersonal violence. This supportive healing space has rolling, open-enrollment, where drop-in attendance is welcome. It is open to anyone whom identifies as a survivor of interpersonal violence. This group will meet Wednesdays, from 7-8 pm in the Davison Health Center Solarium. If you have further questions or comments, please feel free to contact me at jdebari@wesleyan.edu.